When was the last time I actually wrote about how much fun I had partying and just being happy? I can't remember. I've been trying to do as much blogging work as possible before internship begins so I haven't gotten enough time to just sit back and relax. Gone are the days when I could write about adventures Fai and I did over the weekends. It's sad but we can't always have the best of both worlds. I did have A LOT of fun over the past few days though. And "A LOT" is an understatement. First of all, Fai and I finally went for proper dinner together. Or should I say, we went on a feast. hehe. I can't remember the last time we actually ventured out and treated ourselves to good food. After doing a few research, we decided to head to a relatively new bar/restaurant that (we heard from our friends) served really awesome food. It is called 26 Tapas Bar and is located at 26 Kandahar Street. Just a quiet lane away from busy Arab Street. It is definitely a great place to settle down and unwind after a shopping spree at Haji Lane. I love the location a lot because everything seemed a little more peaceful there. Perfect for people like myself who needs a little quiet time. The service is impeccable and we were very well taken care of by the waiters (which we later found out that they were the bosses of the bar/restaurant.) 26 Tapas Bar is owned by two passionate young men who constantly made sure that we enjoyed our food. It was a really pleasant experience. Also, we were told that the food on the menu were all innovated and created by their chef so you can expect to find delicacies that will never be available anywhere else! These aren't just regular western food! There's a little bit of changes in each of them which makes 26 Tapas Bar unique. Fai and I honestly couldn't decide which dish to pick because they all sounded so tempting. In the end, we just went ahead with whatever the bosses recommended. The first dish we were recommended to try, not just by the boss but by our friends as well is the Stuffed Mushroom. If you ever visit 26 Tapas Bar, this is a MUST-TRY dish. I think that this might just be their signature dish. It's basically mushroom stuffed with chorizo, bacon and melted cheese. Just stop and think about the flavors. It's probably one the best things I've ever eaten and guess what, I don't even like mushroom that much to begin with. But this was an exception because it was just heavenly. We were told that this dish gets sold-out by lunchtime. So get your asses there fast before it's gone! Next, we tried the Steak Cubes with pan-fried mushrooms and asparagus served with their very own sauce. If you're beef-lover like myself, you won't wanna miss out on this dish. It's a mouthful of flavors that goes extremely well together. The steak cubes are juicy and tender bite-size pieces that are great for sharing. All of their Tapas dishes are only $9.90 per plate, which is totally worth it for both quantity and quality. OMG. My mouth is watering now while typing this post. Need to go back again soon! Of course, I ordered Truffle Fries too. hehehe. How can I not? I especially love fries that are thin like these and just look at the generous amount they served! Super worth it. Here's what Fai ordered and was crazy about. It's called 3 Little Pigs. Pork lovers, listen up! This is a pizza combination of Pork Belly, Crispy Bacon, Charsew topped with Cheddar Cheese. I know right? It definitely owns the "OMG" factor. Personally, I am not a fan of pork so Fai ate the whole pizza by himself. HAHA. I only had one slice and even though I'm not a fan of pork, I have to say that it was one of the most flavorful and scrumptious pizza flavor I've ever eaten. As for me, I was torn between Prawn and Pesto Aglio Olio and Bacon and Mushroom Aglio Olio. So I had the latter but I got them to throw in a little bit of prawns. hehehe. I have always been a fan of Aglio Olio and I've probably already eaten 7 different Aglio Olio dishes in my life. Trust me when I say that 26 Tapas Bar serves one of the better Aglio Olios I've ever eaten. The awesome thing about it is I got to choose how spicy I wanted it to be. Usually, I can't do that and I'd end up constantly drinking water instead of enjoying the dish. So kudos to 26 Tapas Bar for allowing me to decide on the spiciness. At this point, I was wondering where their chef came from because he's a genius! Each and every one of his dishes were perfectly executed and plated well. Fai and I both agreed that 26 Tapas Bar is a great place for dates. I mean, after you've enjoyed a nice meal, you get to sit back, relax and have a couple of drinks. Also, since the ambience is really calm and peaceful there, you get to really know more about your other half. It's been a pretty long time since Fai and I sat down next to each other to unwind. So we took the opportunity to grab a couple of drinks. hehe. The awesome thing about these shots is that you don't taste the alcohol at all. There's only a slight after-effect if you know what I mean. All in all, it's an enjoyable drink that tastes just like candy. And sure of course, we did get that popping sensation after. That was a pleasant surprise! Oh yes, and I had to try their Banana Bread Beer. I have never heard of this before but it sounded so damn good. I mean, if you like bananas, you'll wanna try it too. To sum it all up, 26 Tapas Bar is a place to visit if you love good food, awesome people and a nice ambience. TRUST ME, THEIR FOOD IS AMAZING. I will definitely be back for more of their stuffed mushrooms. It is to-die-for. I think that this would not only be a great place for dates, but for friends to come together and hang out as well. 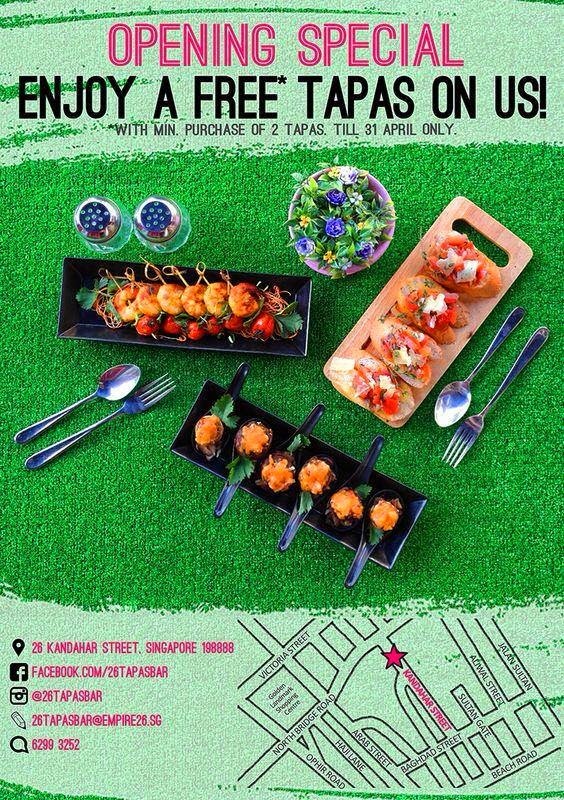 I can't wait to go back again knowing that they have a promotion till April whereby if you get 2 Tapas dishes, you'll also get to enjoy an additional complimentary Tapas dish. Buy 2, get 1 free for less than 20 bucks!! What a steal. Nearest MRT station would be Bugis. For more information, head over to their Facebook page and follow them on Instagram! Thank you my dearest princess Ashleigh for coming! I am always here for you ;) MUCKS! What made the entire night even more enjoyable was having Xavier around. Thanks to him, both Ashleigh and I were soaked in water! It's always a party when he's around. Ended the night at Azzura. This is why I'd choose beach parties over club parties any day! First of all, you don't have to dress up for beach parties unlike club parties where you find yourself battling against heels and blisters -.- Not cool. At a beach party, you'll most probably be in a bikini so getting wet is fine. You don't have to worry at all about your SGD$70 dress getting soaked in Vodka or something. Alrighty! That's it for now. Once again, thank you Absolute Affairs! And thank you all for reading! Never be caught wearing the same dress as someone else again! This SSD exclusively self-manufactured piece is not only super comfy but really gorgeous and versatile as well. This piece is available in Black and White as well but I chose the one in Peach because it's so sweet-looking. Next, I'd picked the destroyed denim jeans. It's definitely one of the trendiest apparel now and you can get yours from Sassy Dream. It is definitely a comfortable way to make a statement. I love it and because it's a pair of jeans, it's timeless and will go a long way. A great investment! Quote "Eunice10" to enjoy 10% OFF your total bill!